For the adventure of a lifetime along the Ganges River, a cruise aboard Ganges Voyager II is just the ticket. 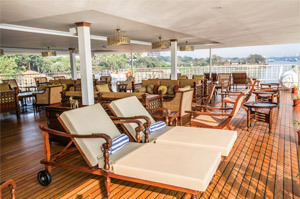 The 56-passenger Ganges Voyager II continues Uniworld’s reputation of being one of the best river cruise companies in the world. She will deliver you to ports, sights and lands that you would not encounter on an ocean liner. 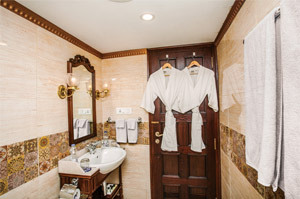 Don’t be fooled by her small size; Ganges Voyager II provides you with upscale accommodations, excellent service and an amazing itinerary through India. This is one ship that you do not want to miss out on! The highlight of any Uniworld river cruise is the river itself, along with the mystique of the destinations that await you. The current 2018 itinerary for Ganges Voyager II is India’s Golden Triangle and The Sacred Ganges. Prepare for all of your traveling dreams to come true with these fantastic itineraries! Your dream vacation is just one click or call away. Don’t miss out on the exclusive savings and limited-time deals you’ll get by booking with us. Contact us now to start instantly saving on your next voyage aboard Ganges Voyager II. 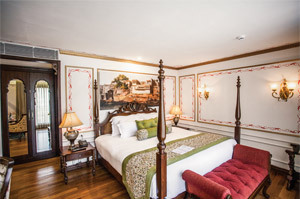 Imagine walking through India’s first Mughal garden; exploring the Taj Mahal by day and night; touring the stately City Palace and Jantar Mantar astronomy center in Jaipur; stepping into the home where Mother Theresa once stayed and worked; touring the fascinating landmarks of Kolkata’s city center; riding a trishaw to Kalna’s Rajbari temple complex to experience some of the great temples of India; watching Matiari craftsmen work metal to create wares; and exploring a palace that has one thousand doors. With Ganges Voyager II, all of these adventures and more are real possibilities, hassle-free and with everything you need provided to you. Have fun while checking off your traveling bucket list with all of the phenomenal stops along the Ganges River. 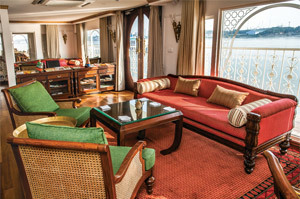 While staying aboard Ganges Voyager II, you will never fall short of great amenities and entertainment. 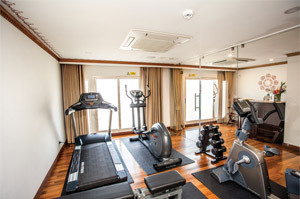 Upon its three decks, you will discover a mouthwatering main restaurant, an inviting observation deck, a relaxing lounge and bar, a rejuvenating spa, and a heart-pumping fitness center as well as onboard local entertainment and enrichment lectures. You will never fall short of something to do! A main highlight of sailing on Ganges Voyager II is the unforgettable culinary experience. Seasoned with all the best flavors and dishes from every single stop along the way and flavored with the freshest and most authentic of ingredients, your taste buds will have you coming back for more each night. 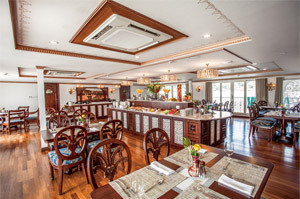 After a long day of sightseeing you will probably work up quite the appetite, and you can be sure that Ganges Voyager II will continue to please in the culinary aspect of your vacation. On this cruise ship, you can expect to be served authentic Indian dishes onboard and offboard. With chefs picking ingredients from local markets, your food will be the freshest rendition of local cuisine that will simply melt in your mouth. Along with your dinner, enjoy hand-selected wines paired with your food, truly giving you the best of both worlds. Afterwards, you can retire to your lavish stateroom, where you can bask in the comforts of fine accommodations that are sure to enhance your voyage on Ganges Voyager II even more. All suites include a large sitting area and beautiful French balcony. 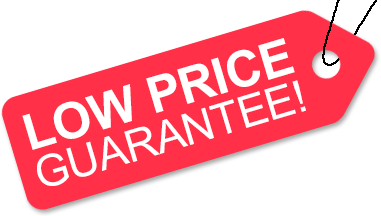 Low Price Guarantee on all Ganges Voyager II Cruises! Book any Ganges Voyager II river cruise with us and you'll get the best deal possible, regardless of the ship or sail date! Because of our "Low Price Guarantee," nobody beats our Ganges Voyager II cruise prices, so look around and you're sure to find the best Ganges Voyager II cruise deal possible when booking with us! We do not charge booking fees on any cruises! You're sure to enjoy an affordable Ganges Voyager II cruise when booking with us! Our special offers on Ganges Voyager II cruises may not be combinable. Certain restrictions apply to each offer. Click a price below to view the Ganges Voyager II cruises during that month in that destination. The deck plans of Ganges Voyager II provided on this page are subject to change. We reserve the right to correct errors. Please verify all information with Uniworld directly. For photos of staterooms, please click the accommodations tab provided above. The following photos are of Ganges Voyager II's sister ship, S.S. Antoinette. Ship is subject to modifications.